We've sniffed out the San Francisco's best ideas for a day of doggie fun. Find San Francisco's top dog-friendly hotels, restaurants, shops and outdoor spots. San Francisco has always been known as a dog-friendly town, for its many off-leash dog parks and dog play areas. Dogs are free to roam in several parks in San Francisco, and in restricted zones at other locations. 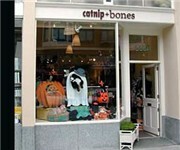 Catnip & Bones - San Francisco, CA - This quaint shop offers a sampling of gifts for dogs, cats and their doting owners. The store's mission is to deliver the best quality pet goods for an economical price. Items include a wide variety of tasty all-natural treats for furry friends and fun, yet utilitarian, gifts such as the "Cat Sitter" videos for pet owners. Cheeko B Pet Boutique - San Francisco, CA - Cheeko B Pet Boutique is San Francisco's newest and chicest pet boutique. Located at the intersection of Union Square and Nob Hill, Cheeko B brings San Francisco residents and visitors a unique selection of collars, leads, toys, accessories, grooming products, apparel, carriers, beds, food and treats for dogs, cats and their owners. Bernal Beast - San Francisco, CA (509 Cortland Ave, (415) 643-7800) - Independently owned and operated pet store stocks food, supplies, accessories and toys for dogs, cats, birds and fish. Bernal Beast carries all natural, organic pet food and organic raw food as well as all natural supplements and treats. Jeffreys Natural Pet Food Company - San Francisco, CA (3809 18th St, (415) 864-1414) - Jeffrey's is known as San Francisco's premier resource for natural pet health information and products. "We prepare our own locally sourced, handmade, fresh, and organic pet foods five days a week. Our food contains only the highest quality ingredients: raw, free range meats free from hormones and antibiotics, fresh organic vegetables, vitamins and minerals." 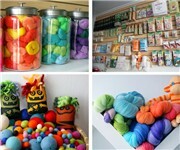 The Urban Pet - San Francisco, CA - This urban-chic location is an unusual fusion of art gallery and pet store. With everything from jeweled collars and apparel inspired by European designers to custom-made furniture, the store has a reputation as one of the most fashionable places to shop for pets in San Francisco. The adjoining gallery, where customers can commission artist Rive Nestor for pet portraiture, features her renowned paintings and bronze sculptures. 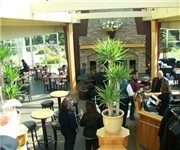 Park Chalet - San Francisco, CA - Great place to hang out with your dog and grab a burger and a beer. They have a huge back lawn area and dogs of all sizes are welcome if leashed. On a nice day though the place can get really packed as it's located right across from Ocean Beach. So if you just looking to grab a quick bite I'd try something else. If you want to soak up some sun and hang out, have some good food and maybe a few drinks this is the place. Cafe Bastille - San Francisco, CA - Leashed dogs are welcome to join their owners for alfresco dining at this bustling cafe. The decor and architecture are meant to evoke a Parisian metro station, but the theme never dips into cheesiness. The interior is warm, bright and slightly funky, while outdoors, white umbrellas line the alleyway seating. Savory sweet crepes and a variety of mussel dishes are cornerstones of the typically bistro fare. The full bar has a good selection of moderately priced French and California wines. B44 - San Francisco, CA - Dogs are welcome in the outdoor seating area, which is kept at a comfortable dining temperature with heat lamps. B44 features a full bar, heated terrace seating with lamps and a canopy. There is bistro style seating. Flippers Gourmet Burgers - San Francisco, CA - Dining with your dog in tow? Grab a seat on the sunny outdoor patio, where Fido will be comfortable. Neighborhood locals flock to this down-home favorite to enjoy breakfast items from a typical morning menu, or munch on specialty hamburgers and curly fries. The interior features a semi-exposed kitchen and smattering of simple tables, while the outdoor patio is just as basic, with a Royal Grounds Coffee outlet. Dolores Park Cafe - San Francisco, CA - A clean, welcoming coffeehouse and lunch spot for pet lovers and their dogs next to Dolores Park. Relax and read the paper or check out the cool black-and-white photographs on the sunny yellow walls. Big windows offer pretty views of the vast green expanse across the street. Many dog owners stop in here on their way to the park, so expect to step over at least a couple of pooches on your way in. The park-side location and density of canines ensure a lively afternoon of people and pet watching. Argus Lounge - San Francisco, CA - Casual Mission hangout features weeknight happy hour specials, pool table, and live music almost every night. "The bartender greeted us with a dog biscuit and the patrons all took the time to make our acquaintance. We enjoyed sitting on the vinyl booth benches and heard stories of Weezer – a Boston Terrier that frequented Argus and was the greatest bar dog ever." Corona Heights Dog Park - San Francisco, CA - Corona Heights Park is a large, open space, city park, with panoramic views of the city and the bay. Corona Heights Park also features a fenced-in, maintained dog park. Dolores Park Off Leash Dog Park - San Francisco, CA - Dolores Park is a San Francisco, California, city park located in the neighborhood of Mission Dolores, at the western edge of the Mission District, which lies to the east of the park. Dolores Park is two blocks tall by one block wide, based on the configuration of north-south and east-west blocks in that part of San Francisco. Dolores park offers several features: several tennis courts and a basketball court, a soccer field, a children's playground, and an off-leash dog play area. 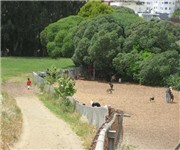 Mountain Lake Dog Park - San Francisco, CA - Mountain Lake is a 10 acre park with a full Off-Leash area for dogs. Golden Gate Park Dog Areas - San Francisco, CA - Golden Gate Park is one of San Francisco's most popular pet-friendly parks and stretches across more than 45 city blocks. Golden Gate Park offers gardens, lakes, waterfalls, a Victorian conservatory, a bandstand concourse, the Japanese Tea Garden, a polo field, a golf course, massive lawns and athletic fields and a first-rate children's playground. Golden Gate Park has four off-leash dog friendly areas and runs. 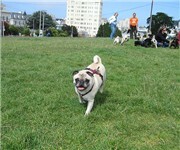 Alta Plaza Park Dog Park - San Francisco, CA - Alta Plaza Off-Leash Dog Park is a place where both kids and dogs run free. It is located near schools, and has tennis courts and a basketball hoop available. The off-leash area is well marked with paint on the pathways. Dogs should be leashed when not in this area, and they must be cleaned up after at all times. The park also enjoys a beautiful view over the marina and into the San Francisco bay. Lafayette Park Dog Park - San Francisco, CA - Lafayette Park Dog Park is an off-leash dog park area in the Pacific Heights neighborhood of San Francisco, CA. This park is very popular with dog owners but is located on a steep slope with nearby heavy traffic, so dog owners should use extra caution. Kimpton Hotel Monaco - San Francisco, CA - The boutique Hotel Monaco in downtown San Francisco takes care of all its guests in style, including our four-legged friends, taking the term "dog friendly hotel" to a new level. Our luxurious hotel will provide the ultimate of pampering for your four legged friend at no additional cost. Items that will be placed in your room for use during your stay include: a copy of the book The Dog Lover's Companion to the Bay Area; a luxury dog bed, designer water and food bowl set on top of a decorative mat; and of course a few "clean-up" bags. A dog toy will also be left waiting for your favorite friend to play with during the stay or to take home as a souvenir. Kimpton Serrano Hotel - San Francisco, CA - Enjoy a luxury stay with your pet at the Serrano Hotel - downtown San Francisco's pet friendly hotel. Stay with us at the dog-friendly Serrano Hotel in downtown San Francisco where we take care of all our guests in style - including your pet. Our pet-friendly hotel staff is ready to help meet the needs of your furry four-legged friend. W San Francisco - San Francisco, CA - A dog friendly hotel in the heart of the SoMa district, the city is in reach. Neighbors with the San Francisco Museum of Modern Art, W San Francisco faces the beautiful Yerba Buena gardens and is a short walk to Union Square's shops, Financial District & the Waterfront. Ultimate Unwind- Your oasis beckons. 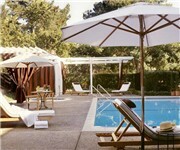 Unwind in the heated lap pool, Zen on our cabana-ringed outdoor terrace. Marina Motel - San Francisco, CA - Marina Motel is a dog friendly hotel! Built to celebrate the opening of the Golden Gate Bridge, this hotel is one of the nation's first motor inns. Each room at this slice of Americana comes with a private garage. It's in one of the trendiest neighborhoods in the city; shopping and dining are plentiful, and the Presidio and Palace of Fine Arts are in easy walking distance. Enjoying beautiful surroundings away from the hustle of downtown means that visiting popular tourist attractions will require a car or public transportation. Hotel Vitale a Joie de Vivre Hotel - San Francisco, CA - Hotel Vitale is a dog friendly hotel offering treats and toys for our four-legged guests. Hotel Vitale is a full service luxury hotel with 24-hour room service, twice daily housekeeping service, valet parking and Wi-Fi in all guestrooms. Our Circular Suites have panoramic "infinity views" of the San Francisco Bay that can be enjoyed from the bed or soaking tub. We also offer 1,600 square feet of indoor conference space and extensive rooftop event space overlooking the Bay - an ideal location for your next San Francisco meeting or event. Their Pet Palace package includes designer mineral water, treats, pick-up bags, and pet necessities such as food, leashes, and toys. Laurel Inn a Joie de Vivre Hotel - San Francisco, CA - Like the charming Pacific Heights neighborhood that surrounds it, the Laurel Inn is noted for its warm sense of hospitality and stylized sophistication. Designed as a contemporary take on mid-century style, the Laurel Inn incorporates a sophisticated and comfortable interior drenched in rich colors, relaxed textures and ingenious details. Each spacious guestroom is designed in the style of a modern San Francisco studio apartment, some offering great views of the city. Dog friendly hotel offering pet beds, water and food bowls, toys and treats. Prescott Hotel - San Francisco, CA - The Prescott is the crown jewel of the Kimpton Group, offering four-star quality, room service from Postrio, and a spectacular suite with baby grand piano and a private terrace hot tub. Doggies are welcome at no additional charge and are provided with food/water bowls, bottled water, faux sheepskin pet bed, treats, leash, and pick-up bags.